Japan's Ryo Miyazaki (20-0-3, 11) really doesn't seem to know how to have an easy fight. He appears to make every fight look difficult for himself and appears to look a little disappointed if he's not bleeding from multiple wounds. Earlier today Miyazaki was again given a hard, rough bout in which he suffered several cuts, swelling around both eyes and came incredibly close to losing his unbeaten record as he defended his WBA Minimumweight title for the second, and likely final, time. Facing off against Mexico's Jesus Silvestre (27-4, 20), it seemed obvious that Miyazaki would have a tough contest on his hands and this time around he wasn't going to have a choice as to whether the fight was going to be easy or hard. The fight started with the naturally bigger looking Silvestre on the front foot almost forcing Miyazaki in to becoming the boxer. Although we got some trading segments as Miyazaki's natural fighting heart came out he did look like he knew he had to fight within himself in the early rounds. Unfortunately for Miyazaki he would end up shaken up in the second round following a nasty clash of heads. It was head clashes that ultimately gave Miyazaki his sense of feeling as another clash in round 5 left both men reeling in pain. Between the head clashes in round 2 and 5 we had a very close fight with neither man managing to get the upper hand in a bout that really was even. The work of Silvestre certainly looked to be the more numerous stuff but the shots of work of Miyazaki raised cheers from the partisan crowd time and time again. By round 6 the blood was seeping out of Miyazaki's left eye and it seemed to almost force him to become more and more of a boxer. Unfortunately the "boxer" role isn't one that tends to suit Miyazaki and his warrior spirit though it's something he actually did well to start the second half of the fight. Of course anyone who has seen Miyazaki fighting knows that even if he's forced to box he won't ever do it for long and in round 10 the hard fighting returned as both men seemed to realise that they might not be "winning" the bout. If the warrior mentality of Miyazaki's returned in round 10 then it was in full flow by the end of round 11 as both men stood and traded bombs, with 2 huge shots tagging the champion in the closing seconds. The action that had ended round 11 seemed to return in the final round, again with Silvestre getting the best of it. The Mexican, aware that he was fighting away from home may have secretly known that the fight was too close for him to get the win though unfortunately he was unable to change that in an excellent final round. Due to the close nature of the bout no result was going to be wrong, and a majority decision in favour of Miyazaki with scores of 115-113, 115-114 and 114-114 showing a fair reflection of the fight. Of course Silvestre will feel as if he deserved the victory though fighting away from home he probably did need to do just a little bit more than he managed. The loss for the Mexican isn't all bad, he's proven he belongs to be in the ring with any elite Minimumweight, and in fact a fight with someone like Katsunari Takayama, the IBF champion, could well be something special. 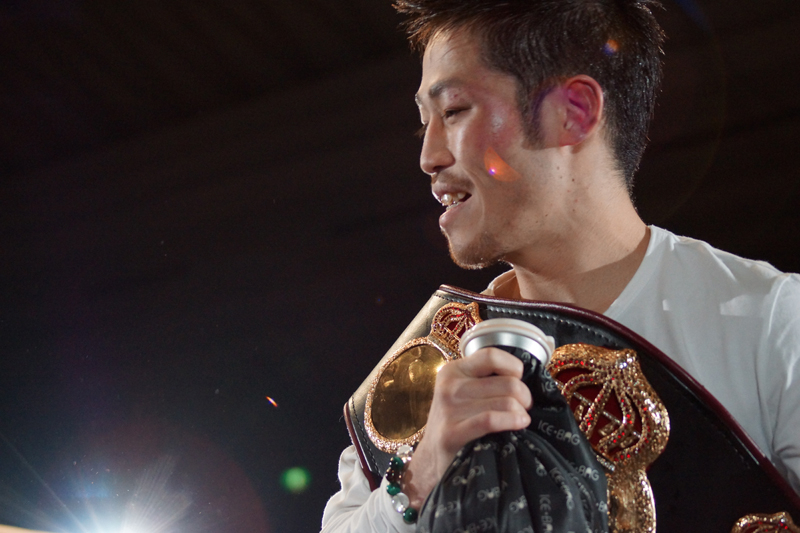 For Miyazaki the fight seems likely to have been his last at 105lbs with his post fight interview indicating that he's likely to vacate his world title and move up the Light Flyweight in his next contest. It was at 108lbs that Miyazaki did really begin his career and it would seem likely that he's genuinely struggled with those final 3lbs so the move up will seriously help his career.